Tender, slow-cooked beef and the sweet roasted flavour of stout, add real depth to this pub favourite. The filling for this pie is cooked long and slow, tenderising the beef and allowing the flavour of the Guinness to permeate it. You could prepare the filling a day in advance. 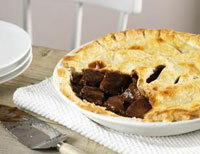 For this pie I use a traditional short crust pastry but you could use a puff pastry as an alternative. Dice the beef into 2.5cm cubes. Place the flour in a medium-sized bowl and season well with salt and pepper. Roll the beef in the flour to coat. Heat the oil in a large pan and fry the beef until golden brown in colour. Add the tomato purée and cook for 1 minute, stirring well. Then pour in the Guinness and add the shallot, thyme, bay leaf and garlic. Season with salt and pepper. Cover and simmer for 1½ hours. Remove the bay leaf and discard. Transfer the meat to a 20cm pie dish 5-7cm deep. Roll out the pastry and cover the pie. Scrunch the pastry to the edge of the dish and trim around the edge, leaving 1-2cm overhanging. Brush the top with the egg. Transfer to a baking tray and place in the oven. Bake for 15-20 minutes and serve immediately.